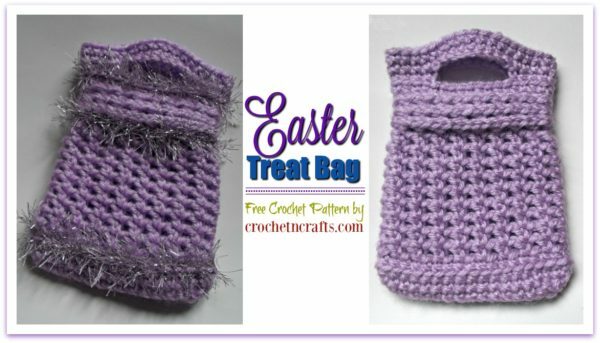 This crochet Easter treat bag is worked up in one of my favorite crochet stitches: the extended single crochet. It works up quick and easy, and you have the option to add a bit of fun fur to make it extra special for your little girl. And when she is done with the candy, she can use it as a little purse or treasure bag. 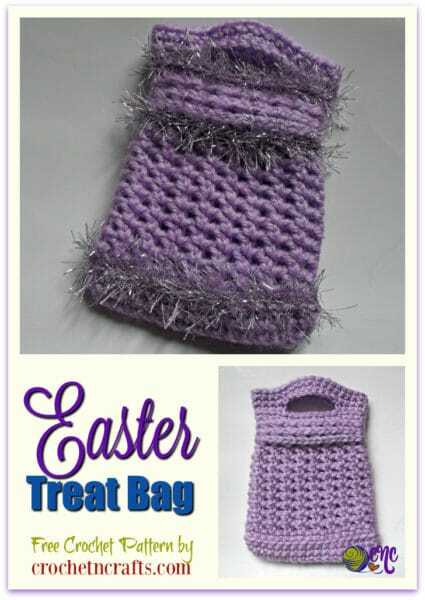 This adorable crochet bag is rather small, which makes it ideal for use as a candy bag or as a little girl’s purse. However, if you like, you can always do more rounds to make it taller and use it as a cell phone purse. 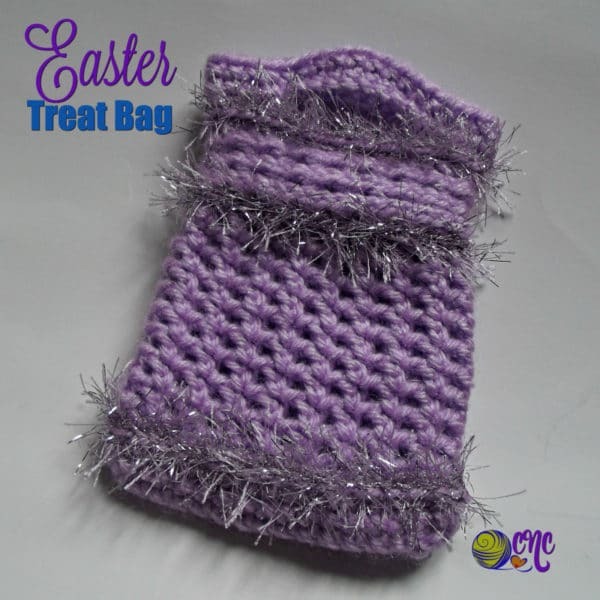 The pattern does not allow much room for a drawstring, which is ideal for treat bags. 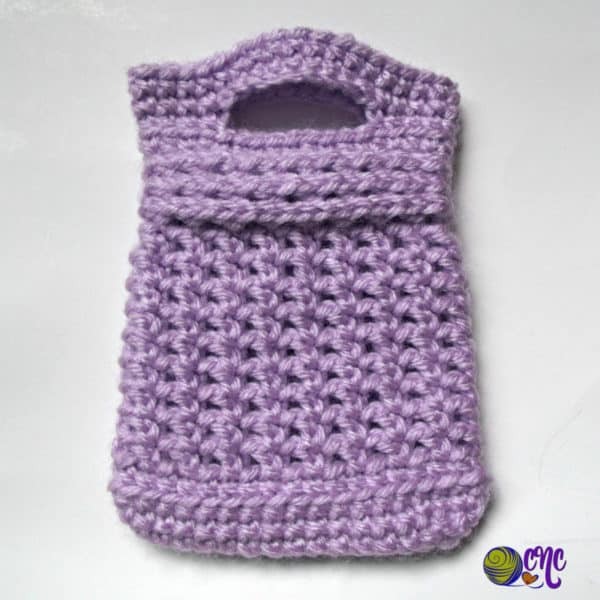 But, with a little patience, you can insert a small zipper at the top to keep it closed nicely. Personally, I prefer the fun fur, but you can always omit it if you don’t have it on hand or if you simply choose not to use it. The ribbing at the top of the bag looks great either way. Yarn: Small amounts of Red Heart Comfort #4, Fun Fur of your choice. Finished Size: Laying flat it measures 4″ across by 5.5″ high. 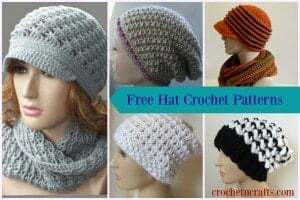 Extended Single Crochet – (ESC) = Insert hook in stitch indicated, yarn over and pull up a loop, yarn over and pull through one loop, yarn over and pull through both loops on hook. Lay the bag flat and mark off 9 sts in the middle on each side of the bag. 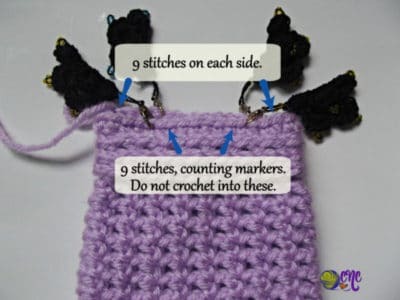 Do not crochet into these 9 sts. 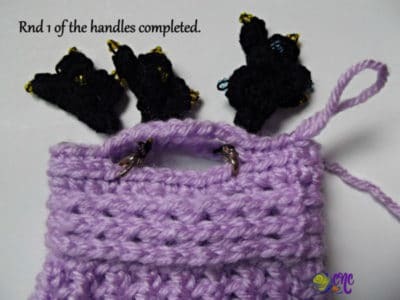 You should have 9 sts on each side of the markers for you to crochet into to make the handles. Rnd 3: Ch 1, sc in same st as join and into each st around; join with sl st in first sc. [36 sts] Fasten Off. Optional: With Fun Fur, sl st in front loops of Rnds 3 and 18. Then, working around the posts of Rnd 14, (sl st, ch 1) around. Not what you were looking for? Why not check out the rest of the bag patterns on CNC, or have a visit to CPB for more candy bag patterns.